Tropical Hideaway is a luxurious boutique style property, offering accommodation in the ‘Tropical Hideaway Villa’, consisting of the fabulous ‘Infinity Studio’ on the lower pool level and an incredible ‘Penthouse Suite’ encompassing the entire top floor. The spacious ‘Pool House’ which is fully equipped, has a second mezzanine bedroom and adjoins directly onto the stunning Infinity Pool and ‘HIBISCUS COTTAGE and Palm Cottage’ which are both very private and enjoy the most amazing views of the Caribbean Sea. Specializing in couples and small groups, Tropical Hideaway can accommodate from 2 to 12 guests in an informal, private and relaxed atmosphere. All are available to rent either individually or as a collective group and we pride ourselves with our genuine friendly service and the experience we afford our guests. Set in over 4 acres of pristine natural forest all five accommodations have private veranda’s with jaw dropping views that will literally take your breath away. Vibrant and mature tropical gardens surround each property creating a peaceful and relaxing ambience. All accommodations offer private facilities to the highest of standards and have bedrooms and bathrooms that are spacious and luxuriously appointed. Well laid out kitchens allow you the convenience of preparing your own meals and to dine Alfresco style on your own private veranda. Located in an elevated hillside position high above the famous Princess Margaret Beach and with an incredible panoramic vista overlooking the Caribbean Sea, Admiralty Bay and the surrounding forested hillsides, the views are absolutely stunning and will not disappoint. HIBISCUS COTTAGE is the most highly rated property in Bequia and is our most popular accommodation at Tropical Hideaway. Hibiscus offers absolute privacy and such incredible views that quite simply will take your breath away. Some guests on arrival are so overwhelmed they become speechless. Measuring approximately 8m (26’) wide and with a large covered veranda on the front, this accommodation is the perfect choice for two people wanting the luxury, intimacy, privacy and space that your own cottage provides. It is reached along your own natural stone pathway and down a board walk with steps. The walk is beautiful and takes in the lush tropical gardens of Tropical Hideaway and a hillside garden of mixed fruit trees and colourful Hibiscus plants in a stunning array of colours. Please note that Hibiscus Cottage is situated 67 steps down from the Infinity Pool and pool patio area (we will always help carry your bags). It does however provide absolute privacy and the views are simply stunning. The sunsets here can be breathtaking, the green flashes magical and, if you are lucky enough to be here on a full moon, the shimmering moonlight reflecting on the ocean will take your breath away. It certainly is worth the short one minute walk. Please note Palm Cottage, which is identical to Hibiscus Cottage, offers alternative accommodation (without the 67 steps) on the same level as the Infinity Pool and has stunning views overlooking Admiralty Bay. Hibiscus Cottage is a stunning octagonal shaped studio, is spacious, light and airy and furnished to the highest of standards. A queen size bed complete with luxurious mattress is positioned centrally in the room and ample seating, cupboard and storage space is close at hand. Egyptian cotton bed linens, quality latex memory foam and natural feather pillows, luxury bathroom towel sets, pool and beach towels are all supplied as standard. Two cane and rattan armchairs provide a very comfortable seating area and the panoramic views looking through 24' of glass fronted patio doors are absolutely stunning. The large and private veranda has a bistro dining table and chairs, allowing you to dine Al fresco style and enjoy the ambiance of the outside environment. The well laid out kitchen has a sink unit, 2 burner gas hob, fridge, combination microwave oven and grille, toaster, kettle, cafetiere, Moka espresso maker, blender and a comprehensive range of high quality cooking utensils, crockery and cutlery. An ice bucket is supplied and complimentary ice is available from the Pool Bar ice maker or the housekeeping staff. A spacious en-suite toilet and shower room leads from the open plan living area and this has a complimentary range of toiletries, organic shampoos, conditioners and soaps, together with quality bath linens, robes and pool towels. The latest HD 40” flat screen TV gives access to our in-house entertainment system supplying high definition films, TV, music and Internet radio. The television is positioned to allow viewing from both the comfort of your bed and the sofa seating area. Usb charging points and Wi-Fi is supplied and for those really hot days when the cooling Caribbean wind has taken a rest, you can turn on the air conditioner until the breeze returns. A quality ceiling fan is positioned over the bed. All windows are fully screened and the patio doors have sliding insect screens allowing you to have the doors and windows open and still enjoy the ambience of outdoor living without ever getting bitten. We take very seriously our guests health and well being and having a fully screened and mosquito free environment should be an important factor when choosing your holiday accommodation. At Tropical Hideaway you can sleep soundly at night safe in the knowledge that there are no biting insects or mosquito's in your room. Tropical Hideaway has an 18m (58’) wide panoramic Infinity Pool and is often quoted as being one of the top ten pools in the Caribbean. The Infinity Pool is a stunning feature of the property and with the environmentally friendly solar heating, the pool can be enjoyed at all times of the year. Typically our daytime pool temperatures are around 33 deg C in summer and 29 deg C in Winter. That’s an amazing 94 deg F falling to a very inviting 84 deg F in winter. The extra 3 degrees C created by our solar heating can make an enormous difference to your enjoyment of the pool. There is a swim up, sunken pool bar, complete with fridge, ice-maker, blender and sink, a preparation and serving area and a generous supply of acrylic beverage glasses. Underwater coral seats are conveniently positioned around the submerged bar and this is the perfect place to enjoy a glass of your own personal wine or indulge in your favourite drink or snack. Adjoining the pool is a Gazebo complete with a large daybed and the views from here are just incredible. A perfect place to relax and read a book or simply enjoy the spectacular scenery. The pool deck is tiled using natural stone coral and provides a safe, non slip and cool surface to walk on. Sun loungers, parasols, sunbathing mats and various chairs provide ample seating and relaxation areas around the pool. The pool and pool deck are West facing and receive the sun for most of the day. A cooling Caribbean breeze is usually present and the Gazebo and large parasols provide areas of shade for the hottest part of the day. As the evening sun slowly sets and you look out over the Caribbean Sea, you cannot fail to be impressed. Sunsets from here can be amazing with the elusive ’Green Flash’ often being seen. The setting is simply perfect and with underwater pool lights and discreet Led lighting enhancing the evening ambiance, the special moment can continue long after the sun has set. Over two hundred 5 star reviews on various well known review sites are testament to the attention to detail and location this ‘Tropical Hideaway’ has and reflect our genuine intention that guests arrive as guests and leave as friends. Tropical Hideaway has without doubt some of the finest rooms on Bequia, and coupled with the spectacular panoramic ocean views and the beautiful evening sunsets, you soon realize you are enjoying, what many say, are the finest views on Bequia, from the finest accommodation on Bequia. These discounts are being offered on all accommodation at Tropical Hideaway and vary depending on your month of travel. E.g. 10% discounts for January, March and December, 15% discounts for April and November, 20% discounts for May, June, July and August and 30% discounts for September and October. Please note all prices shown here include the above special offer discounts. *** Complimentary transfers to and from the local ferry or airport *** These are being offered to all bookings of 5 nights or more. *** Complimentary food and beverage welcome packs *** These are being offered to all bookings of 7 nights or more and include a welcome bottle of wine, local beers and soft drinks, bottled water, orange juice, bread, cheese, margarine, tinned tuna, eggs, seasonal salad items, tea, coffee, milk, sugar, olive oil, hot pepper sauce, salt and pepper. A smaller welcome pack is also being provided for 5 night stays. The above ‘Special Offers’ are valid for any bookings confirmed in 2016 and taken during 2016, 2017 and 2018. These are genuine offers that may be withdrawn without notice and at any time. We originally arrived in the Caribbean in 1996 after making a 3 week transatlantic crossing aboard our sailing yacht 'Rainbow Spirit'. This was the beginning of another adventure and after sailing and exploring the Caribbean Islands for 2 years we eventually bought a 2 acre plot of land on the island of Bequia. Having already committed to a world circumnavigation, we set sail again in 1998, went through the Panama Canal and spent the next three years travelling around the world with our three daughters. Although we visited hundreds of white sand, sun-drenched tropical islands, we found none of them compared to the special beauty and charm of Bequia. We returned in 2001 and finally made a start on building our 'Tropical Hideaway'. Building in the Caribbean was never going to be easy and after the frustrations of 2 years turning into 3 years and 3 years turning into 4 years we finally finished construction in 2011. Eight years of full time building and a cost overrun of around 300%. The project was huge, far bigger than we ever imagined, but our hard work, frustrations, pain and suffering eventually paid off and we now have a remarkable property often quoted as having 'the finest views on Bequia, from the finest accommodation on Bequia'. Our daughters have now left to start their own lives and adventures, returning when time and funds allow. Our eldest daughter is now married and lives in New Zealand. Our middle daughter started the first Spa's and treatment centres on Bequia and is now employed by the rich and famous from all over the world. Our youngest daughter is currently working at a safari lodge in a remote part of Zambia and returns to Tropical Hideaway occasionally for the December to April season where she offers her spa treatments and therapy work. As you can see, our wanderlust lifestyle has left a lasting impression on our daughters and they are all enjoying an adventurous and exciting life as we have done. Beautiful Bequia (pronounced bek way) is an undiscovered paradise, the Caribbean of 20 years ago. Covering an area of only 7 square miles, Bequia lies in the warm tropical waters of the Caribbean Sea. It is just a short plane hop from the ever popular Barbados and next to the renowned Mustique, both favourite islands of the rich and famous. It is the largest of the Grenadine Islands known also as the ‘jewels of the Caribbean’ and is blessed with several pristine, white sandy beaches many of which are totally natural and undeveloped. If you want resort hotels, nightclubs and beaches full of sunbeds, don't come to Bequia. If you want to discover the undiscovered, visit our beautiful Island, enjoy the uncrowded pristine white sandy beaches, swim and snorkel in our safe and warm Caribbean waters and experience the genuine friendliness of the local Bequian people. Bequia is an all year round destination with daytime temperatures consistently averaging between 24C (75F) and 30C (86F) throughout the year. A "chilly" evening in the winter months (January to March) might see a low of around 22C (72F) and in the summer months the temperature will occasionally reach 32C (90F). Trade winds bring cooling breezes for most of the year and the famous 'Christmas Winds' bring stronger breezes and livelier seas, perfect for the keen sailor. Bequia truly is a unique Island. Large enough to be interesting and exciting, yet small enough to retain its local charm and uniqueness that only a small 'off the beaten track' Caribbean Island can offer. It truly is an undiscovered paradise that some well known travel journalists are only just discovering and several well known newspapers and magazines have recently published articles and all describe Bequia as an undiscovered paradise, about to be discovered. What more can I say ............. Come see for yourselves! Tropical Hideaway and Hibiscus Cottage have one of the finest hillside locations on Bequia and coupled with the incredible heated Infinity Pool, the spectacular panoramic ocean views & the beautiful evening sunsets, you soon realize you are enjoying, what many say, are the finest views on Bequia, from the finest accommodation on Bequia. The views are simply amazing and are forever changing as ships and yachts of all sizes and nationalities pass by on their journeys and adventures. Having two dive shops and around 24 dive sites, Bequia is a divers paradise. Our diverse marine environment includes relaxing reefs, wall dives, drift dives and even a few wrecks. You can still dive and snorkel away from the crowds in crystal clear waters with reefs that are still pristine. Our abundant and diverse sea life ranges from 100’s of species of Tropical Fish, Octopus, Sea Turtles and Sea Horses to name but a few. Bequia has it all and will satisfy beginners trying out snorkelling, scuba divers who wish to take a Padi course and experienced divers wishing to go on an exhilarating dive. Looking for an adventure? Try Discover Scuba with one of our two dive shops and enjoy a shallow reef dive with one of their experienced instructors. We now have available our brand new forty page 2016 guidebook about Tropical Hideaway and the island of Bequia. It has detailed information about local services, the fun things to do, our local restaurants, day trips to nearby islands and a wealth of other information invaluable for anyone intending to visit our beautiful Island. To read our complimentary guidebook please go to the very bottom of this page or visit our comprehensive website, read our latest 5* reviews, browse through our stunning photographs and download our complimentary 2016 40 page information guide for visiting Bequia and make your dream a reality. A spacious en-suite toilet and shower room leads from the open plan living area and this has complimentary toiletries, organic shampoos, conditioners and soaps. Luxury bath linen sets, robes, pool and beach towels are all supplied as standard. A hair dryer is also supplied. 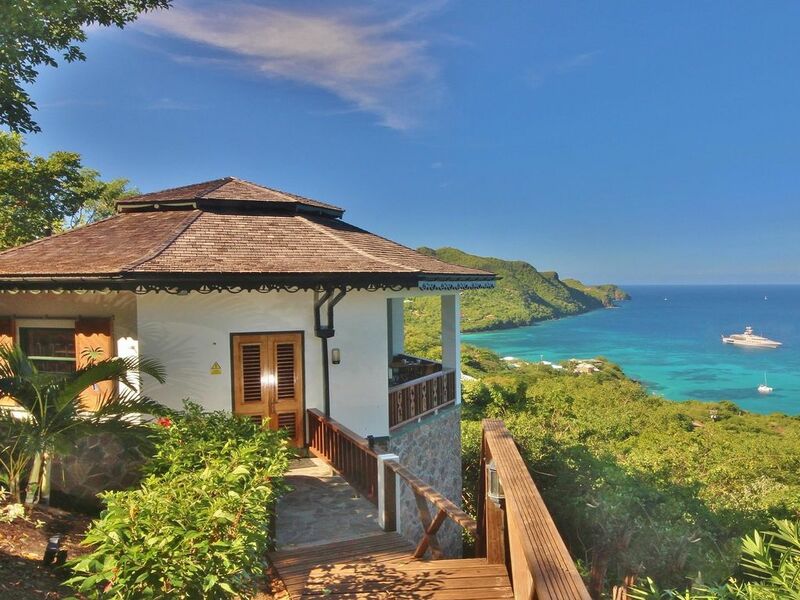 Breathtaking and panoramic views of Admiralty Bay and the Caribbean Sea. Sunsets can be incredible. A complimentary phone is available for guests in the pool bar area for local calls to taxis, restaurants etc. We can also make telephone calls on your behalf. Air conditioning is available in all bedrooms and professional quality ceiling fans are positioned over all beds. Bed linens are all top quality Egyptian cotton with high thread counts. Complimentary use of the laundry room facilities at Tropical Hideaway are included. A clothes line and pegs are provided on the patio area behind Hibiscus cottage. There is safe, easy and plentiful parking at the Tropical Hideaway reception area. We also have our own rental car available at very attractive terms. Quality bathroom towel sets are supplied as are pool towels and beach towels. Luxury rattan style armchair sets provide a very spacious and comfortable seating area. The views looking out onto the veranda are simply stunning. All rooms are fully screened against mosquitoes etc. Combination microwave oven and grille. A cafetiere and Moka espresso maker are supplied. A comprehensive range of high quality cooking utensils, crockery and cutlery is supplied. The well laid out kitchen has a sink unit, 2 burner gas hob, fridge, microwave oven & grille, toaster, kettle, cafetiere & a comprehensive range of high quality cooking utensils, crockery & cutlery. Verandas include bistro dining sets. Dine alfresco style in total privacy with beautiful surroundings and incredible views of the Caribbean Sea. You can spend hours just looking at the views. We provide the latest technology entertainment system that provides music, high definition movies, documentaries and TV series on a Samsung HD 40'' flat screen TV. USB charging points are available. Many interesting books are available from the owners. A comprehensive library of high quality music and internet radio stations are available in your room. A comprehensive library of High definition films television series and documentaries are available in your room. We have two Ocean Kayaks available for guests use. These are subject to a transportation charge to the beach and back. All rooms have private covered patio areas with stunning views and outdoor furniture. On Site Shop. Brand new is our on site shop allowing guests to buy a wide range of quality wines, beers and spirits at local shop prices. We also sell a wide range of soft drinks and an excellent selection of fish and meats just perfect for your barbecue here at Tropical Hideaway. For your convenience all these and much more are now available on site and all at local supermarket prices. Dining in. Special evenings can be arranged for guests where a local chef comes and cooks a special Caribbean meal. You can dine in the most beautiful of locations with the singing chef playing his guitar. We have also arranged with several of the local restaurants for a take away service which can be delivered to Tropical Hideaway. Detailed information can be found in our new 2016 online information guide on Tropical Hideaway and Bequia. Both our Online shop price list and the Bequia guidebook can be downloaded free of charge at the bottom of this page. My husband and I spent an amazing 10 days in Hibiscus Cottage at Tropical Hideaway. Tucked away on the hillside below the main house, it is the most private accommodation on the property. Beautifully furnished, with well equipped kitchen, large bathroom and large bedroom/sitting room, all looking out over the deck which has stunning views of the whole of Admiralty Bay. The whole property is quite incredible. From the moment we arrived until the day we left we felt we were in our own private retreat in one of the most beautiful places we have ever been. Martin and Julie (the owners) were away during our visit but we were spoiled by Liz & Greg who were managing the property in their absence, as well as the other wonderful staff. The whole property is incredible and the views are absolutely stunning. The infinity pool is to die for - I can't imagine a pool anywhere else in the Caribbean that has such a view. For most of our visit we were the only couple in it as it was a quieter time of year. The beaches are all within walking distance (but down a very steep hillside - we walked down and got a cab back!). Beautiful clean beach, crystal clear water and very safe. We were sorry not to meet Martin and Julie, but we couldn't have been treated any better than we were, and we hope to return. Stayed in the Hibiscus suite at Tropical Hideaway. You are immediately made to feel welcome as a long lost friend. Martin and Julie think of everything to ensure your stay is bliss. The views of the property are stunning and the views from the property are jaw dropping. I could find no fault with our suite, the grounds and facilities are clean and well maintained. Highly recommended as the property is nicely removed from the din of the port yet reasonably convenient to the various points of interest. The property was exactly as described in the listing. The view from Hibiscus Cottage was truly breathtaking and the location was very private, something we strongly preferred. Location of the hotel was very central if you're driving or taking taxis to town or around the island. It is a bit of a walk to the main street. Property was extremely well maintained and clean. There were several breakfast options, the ones we chose were tasty and well made (we recommend the avocado toast and yogurt with mango). The store on premise is very useful and convenient and the prices are the same as other stores in town. Also, the abundance of movies you have access to watch in the room is like nowhere I've ever stayed. Martin and Julie were amazing and as helpful as one could ask for (e.g. for recommendations and reservations). I would highly recommend this property to couples or even someone just looking to get away and relax. We enjoyed eating lunch at Jack's beach bar and loved lunch at Firefly after taking their lovely plantation tour. Dinner at Old Fort was one of our favorites. We also did two separate wonderful day trips with Captain Wayne Gooding of Mako Tours to Mustique and then Tobago Cays. For the animal lovers out there, we'd highly recommend a visit to the island's turtle santuary. We thought the pictures were too good to be true but alas were we in for a surprise. We went here for our honeymoon and had the absolute most amazing time ever! From the luxurious and comfortable rooms with high end amenities and utilities, to the friendly staff all around who provided amazing food on a daily basis, to the hosts themselves, Martin and Julie, who ensure that from day 1 we felt welcomed, appreciated and right at home. We would definitely recommend this location to anyone...oh and how can we forget...the Infinity Pool will blow you away! "Perfect Place on a Perfect Island"
Hibiscus Cottage is in my opinion the most private on the property it has an amazing view and is very well appointed for your needs. You are surrounded by jaw dropping views, beautiful landscape and architecture. The hosts Martin and Julie are a pleasure so many kind words to say about them. Tropical Hideway is and will always be our only choice for accommodation. Perfect Place on a Perfect Island. Indescribable views! So incredibly peaceful and exactly what we were looking for! Beautiful Bequia (pronounced bek way) is an undiscovered paradise, the Caribbean of 20 years ago. Covering an area of only 7 square miles, Bequia lies in the warm tropical waters of the Caribbean Sea. It is just a short plane hop from the ever popular Barbados and next to the renowned Mustique, both favourite islands of the rich and famous. It is the largest of the Grenadine Islands known also as the ‘jewels of the Caribbean’ and is blessed with several pristine, white sandy beaches, many of which are totally natural and undeveloped. If you want resort hotels, nightclubs and beaches full of sunbeds, don't come to Bequia. If you want to discover the undiscovered, visit our beautiful Island, enjoy the uncrowded, pristine, white sandy beaches, swim and snorkel in our safe and warm Caribbean waters and experience the genuine friendliness of the local Bequian people. We now have available a free 24 page guidebook with information about Tropical Hideaway and the island of Bequia. It has detailed information about local services, the fun things to do on Bequia, our local restaurants, day trips to nearby islands and a wealth of other information invaluable for anyone intending to visit our beautiful Island. To read our free Information Guide please visit our website, scroll down the Tropical Hideaway 'Welcome' page and click on the guide book. Barbados is the main International airport for the area and SVG Air have a late afternoon 40 minute flight into Bequia that connects with most International flights. Jet Blue flies from Boston, New York, Miami and Fort Lauderdale. American Airlines fly from Miami and Charlotte. Delta flies from New York and Atlanta. Air Canada flies from Toronto and Montreal. West Jet flies from Toronto. British Airways fly from Gatwick. Virgin Atlantic flies from Gatwick and Manchester. Thomas Cook flies from Manchester in the peak holiday season. Condor flies from Frankfurt. GOL Airlines fly from Sao Paulo. Avianca flies from Bogota. Airlines that fly within the Caribbean include Liat Airlines and Caribbean Airways. Liat fly Barbados to St Vincent. SVG air also have flights from St Lucia to Bequia daily (except Wednesday). St Lucia is served by the same airlines above.